The Novelist: A Story-Driven Game Of Impossible Choices : All Tech Considered The fictional Dan Kaplan is struggling to finish a high-stakes book while balancing the needs of his wife and son. You pull the strings in this family drama by scouring the Kaplans' thoughts and memories. The emotion-driven story is compelling, but is a game about real-life problems actually fun? In The Novelist, the Kaplans are struggling to keep their little family together. You play a ghost that tries to help keep the peace. First things first: Yes, this is a game review — but I'm no gamer. I'm surrounded by them at work and at home, mind you, but I personally haven't played a video game since a brief Tetris obsession in junior high. Which is why I surprised myself by wanting to take a crack at The Novelist, released in December by Orthogonal Games. Like a growing number of indie games, there's nary a gun, dagger or blood-thirsty creature in sight. 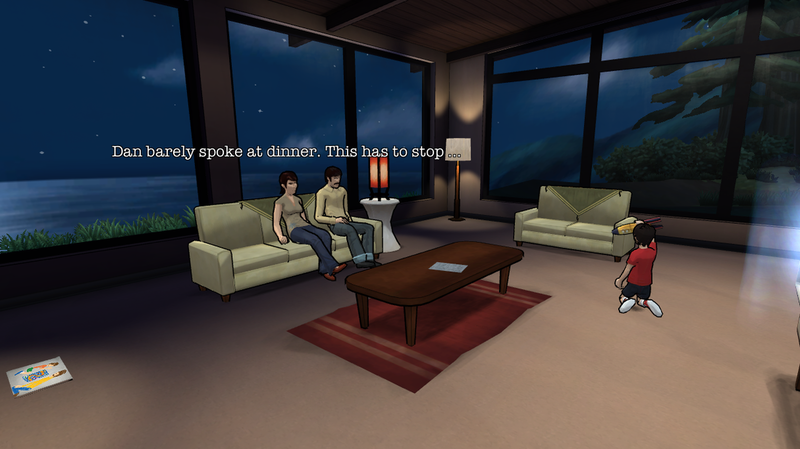 Instead — much like Gone Home — the game focuses on one family's personal dilemmas; in this case, a protagonist trying to reconcile work pressures with the needs of his wife and son. Our novelist is Dan Kaplan, and he's grappling with some serious writer's block. His book deadline is looming and the pressure from his editor is intense. But Dan's marriage is also struggling and his young son is having a rough time at school. It's precisely this focus on real-life challenges — a narrative that struck me as pretty unconventional for the gaming world — that I found so appealing. I don't write books for a living, but I can certainly relate to the struggle to balance professional demands with family responsibilities and other commitments. With its very human drama, The Novelist is the first game to interest me enough to actually try playing. So, about that story. To get a handle on all their troubles, the Kaplans rent a beach house for the summer. Dan's wife Linda will work on her painting, son Tommy will get a break from school bullies and Dan will finish his book while nurturing both these relationships. That's the theory, in any case. But you, the player, are a ghost, pulling the strings in this family drama. As in Gone Home, you wander the house, reading wayward letters and diary entries. You sneak up on the characters at work and play, plumbing their thoughts and memories. The clues explain each person's wants and desires, and in each chapter (nine in total) you must choose Dan's course of action: Work on his book or play a game with Tommy? Attend a book signing or an important family gathering? But while all three Kaplans want different things, you can choose to satisfy only one person at a time. And while you have the option of finding a compromise with a second character in each chapter, the fact is that one person — and often two — will always end up disappointed. The decisions you make, chapter by chapter, alter the course of the entire family's future. As for some mechanics, The Novelist is highly accessible for a newbie. The game universe is small — just a series of rooms in a single house. It's visually appealing; the graphics are colorful and simple. Gameplay is based primarily on reading letters and diary entries on the screen, so there are no complex menus to keep track of. The game has two modes. "Stealth" adds a layer of difficulty to gameplay, because the characters can see you, requiring you to stay out of view. "Story" mode makes you invisible, allowing you to roam the house freely without fear of being seen. As a first-time player, I was pathetic at sneaking around and ended up being spotted repeatedly. Finally, I did myself a favor and played in story mode — even though it felt like cheating. If you're a newbie with keyboard/mouse navigation, I suggest you do the same. Sometimes, Death Is Only The Beginning. Will You Continue? I give The Novelist big points for tackling such an intimate and human-scale story. I respect game developer Kent Hudson's commitment to creating something different (he used to work on AAA games like BioShock 2 and Deus Ex: Invisible War), with a narrative that appeals even to non-gamers like me. That said, this particular family's real-life problems just aren't a whole lot of fun. The Kaplans (at this point in their lives, at least) are pretty unhappy people, and the game's structure means there's actually very little you can do to help them. There's little joy and lots of angst. At nine chapters, I also found the game a bit overlong. Advancing to the next chapter requires completing the same steps again and again, which felt tedious by game's end. A player more in tune with the Kaplan family's dilemma, however, may find the game length just right (it took me five hours to play; someone less inept could probably finish in three or four). To be clear, I did care about the characters. Chapter by chapter, I agonized over each decision, trying to keep everyone in the house as happy as possible. I felt a sense of satisfaction when I helped Linda or Dan achieve a goal, or made Tommy happy with some play time. But those victories are short-lived, since they always require sending someone else into a dark pool of disappointment — sometimes rather improbably. There are lots of people who feel great fervor for The Novelist. It's a finalist for "outstanding achievement in story" at the upcoming DICE awards and has garnered a bevy of great reviews — all of which makes me confident that others will experience this game very differently than I did. So, if you enjoy weighty books and films about angst-ridden characters (and many folks do; hello, Blue Jasmine!) 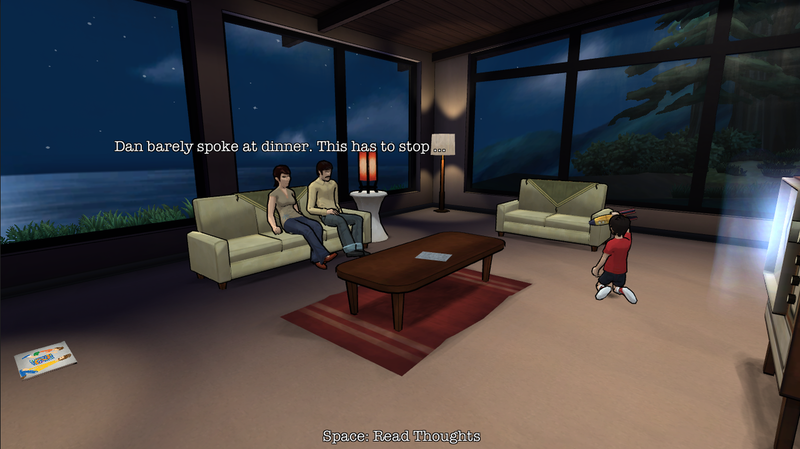 and are intrigued by story-driven indie games, I encourage you to give The Novelist a try. I love that it motivated me to try my hand at a video game, and I hope it inspires other newbies to do the same.